My understanding changed in 2009. 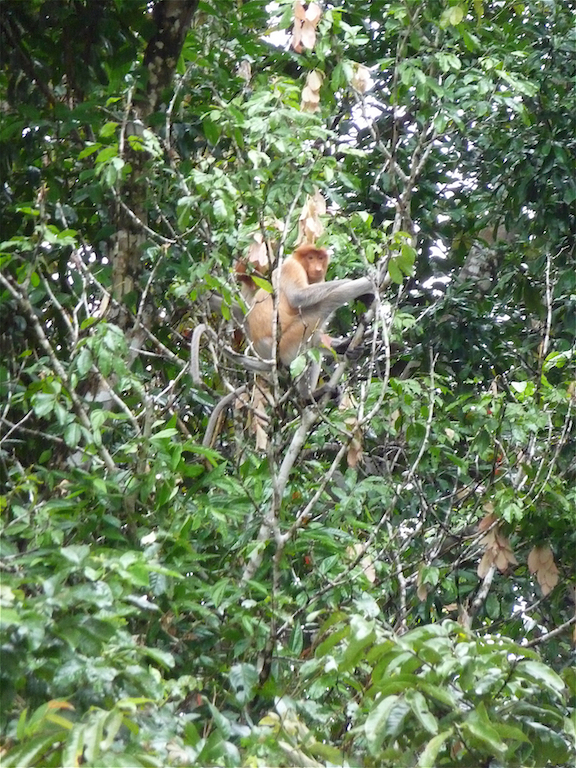 At that time my daughter Rachel was studying for a biology degree at Cardiff University, and together with a group of fellow students she had the opportunity to visit, as part of her Uni course and for a few weeks, a field centre on the mighty Kinabatangan River. 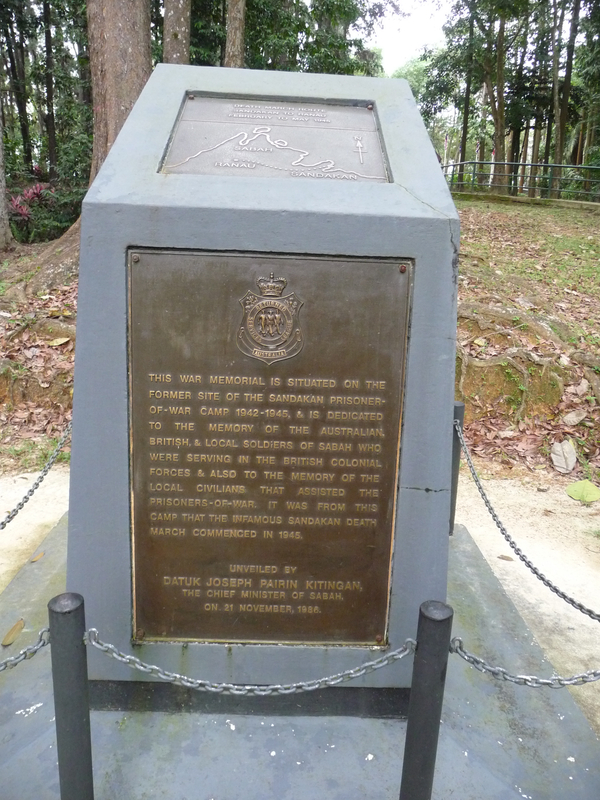 This is located in one of the few remaining pockets of native rainforest/jungle on the eastern part of the huge island of Borneo, itself positioned to the east of Sumatra and Singapore, north of Java, to the south-west of the Philippines and some way north of Australia. 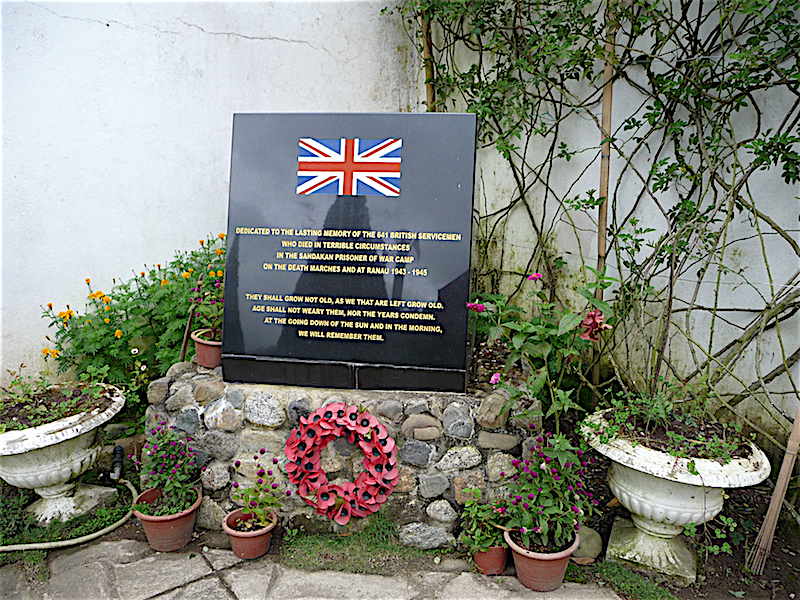 The snag was that she was unable to return to the UK during her year in the Far East (although she travelled widely elsewhere in the region), so it was decided that Elaine, my wife, and I would visit Sabah for three weeks in February 2009. Just managing to get through to Heathrow to escape a snow-bound south of England, we took nearly 40 hours to reach Kota Kinabalu (known by many as ‘KK’), the bustling capital of Sabah, stepping out of the aeroplane into humidity and tropical heat, the like of which we had never experienced. 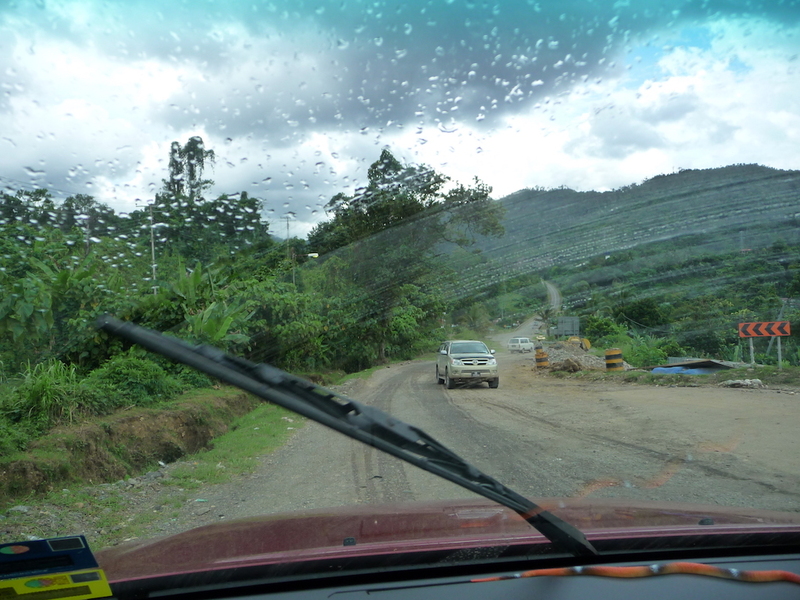 We had arrived towards the end of the ‘rainy season’, but when it rains there, it REALLY rains… as we discovered. I was interested in the motoring scene which features right-hand drive vehicles (with air conditioning, but no heaters required!!) and driving on the left-hand side of the road. At the same time, vehicle speedos and distance indicators, plus signposts etc, are calibrated in kilometres! In buildings I was surprised to find UK-type three pin electrical sockets – a legacy of days gone by. Our original plan had been first to spend some time at the Danau Girang Field Centre (a collaborative tropical biodiversity research and training facility managed by the Sabah Wildlife Department and Cardiff University) where Rachel was based, and then to tour Sabah by road. However, due to flooding of the Kinabatangan River (Danau Girang is built on its northern bank), it was deemed unsafe for us to visit the Field Centre until the waters subsided. 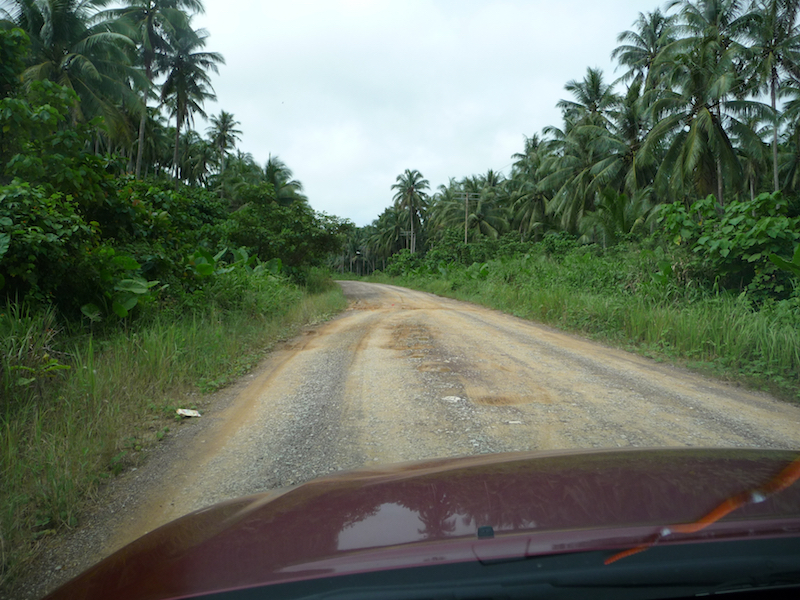 Instead we embarked on our Sabah road trip tour first – working to a brilliant itinerary put together by Rachel and a local friend of hers who was also interested in, and actively involved in, conservation. 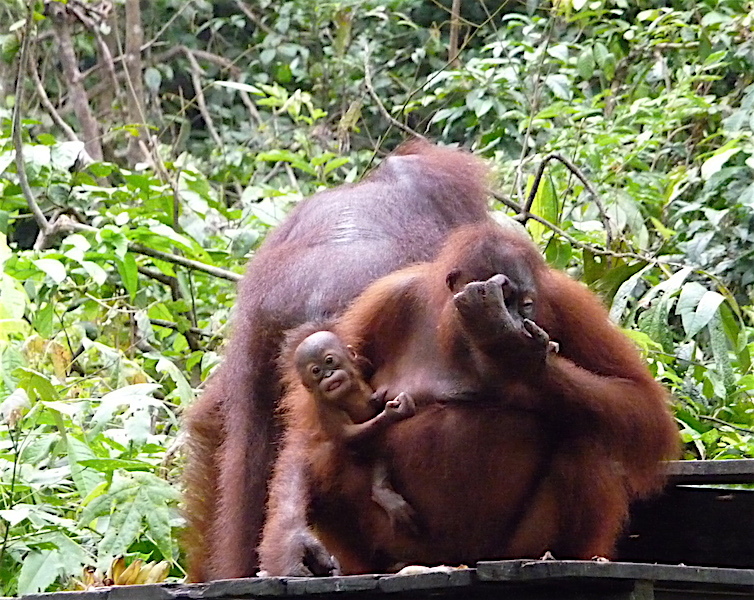 It’s sad but true that the wildlife of Sabah is struggling, due mainly to deforestation caused by clearing of the jungle to make way for palm oil plantations – so that native orangutans, Borneo pygmy elephants, sun bears and other wonderful creatures (plus plants) of the forest simply have nowhere to go… It is possible that (for example) the amazing orangutans could be extinct in the wild here during the next few years; such a tragedy of monumental proportions. (The avoidance, where possible, of buying products containing palm oil from unsustainable sources may help to prevent even more rapid destruction of the native forest. 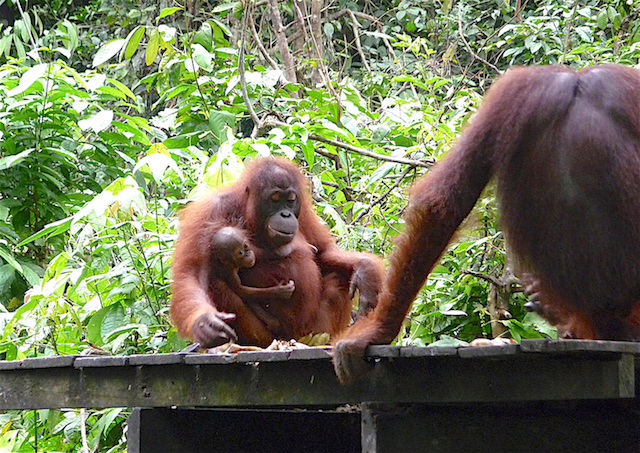 If you would like to find out more, this link leads to some fascinating information about this and which products contain palm oil, also which firms use sustainably sourced palm oil – and which ones don’t, or aren’t saying, etc!… please CLICK HERE). 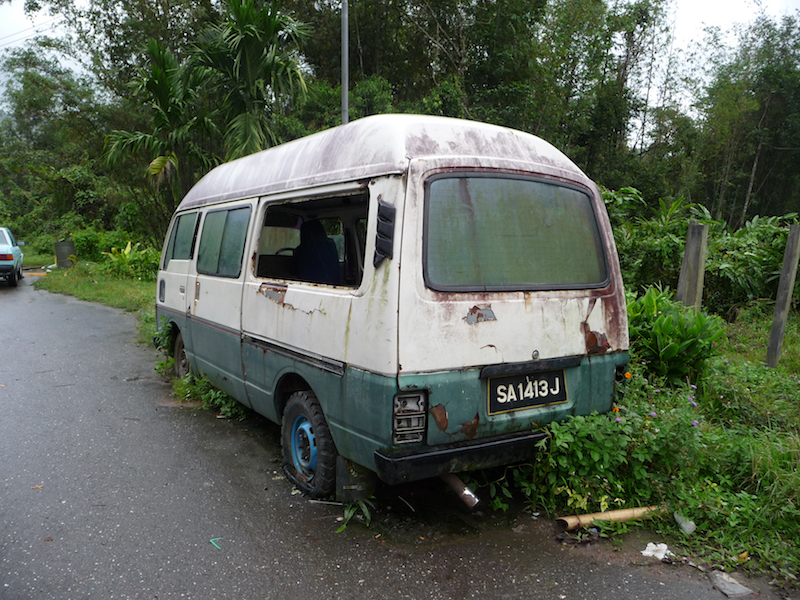 Originally we had planned to hire a vehicle for our Sabah tour, but were told that due to the poor/non-existent road surfaces often encountered outside of towns, it was difficult/impossible to hire a normal saloon or hatchback. 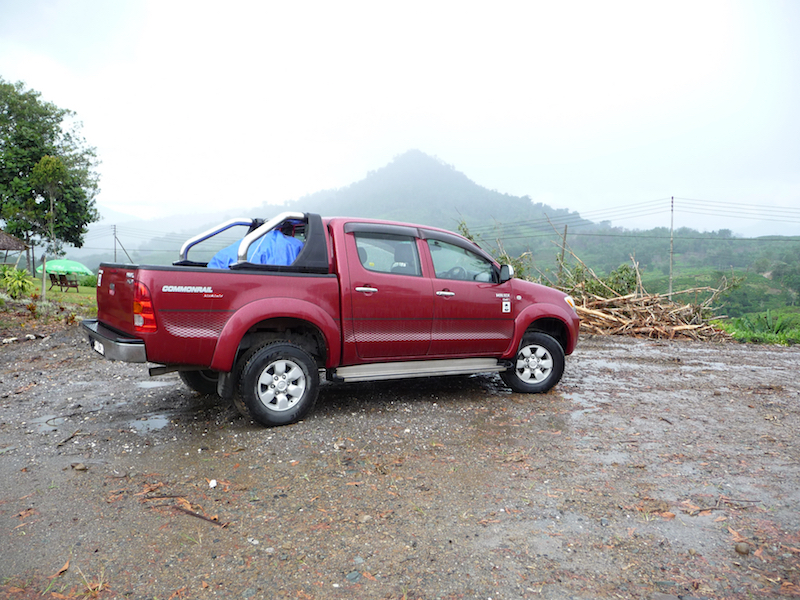 We were advised that a 4×4 would be necessary for meaningful travel, especially as our visit coincided with the ‘rainy season’ that tended to result in even main roads being washed away, and others turning to a quagmire… in fact the doom-mongers weren’t wrong! 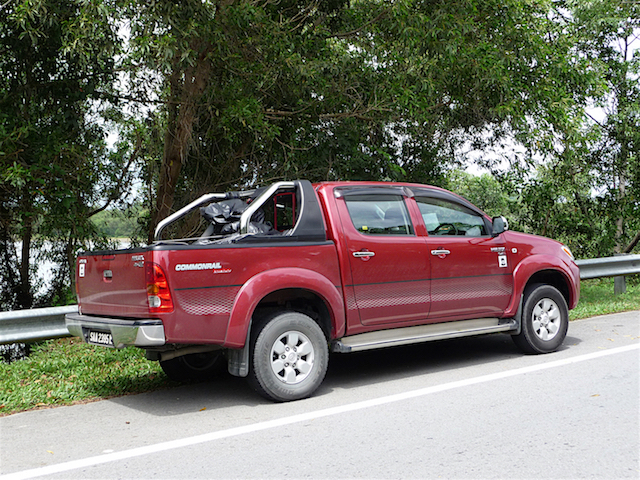 Luckily we were able to privately hire a four seater double cab Toyota Hilux pick-up that proved to be perfect for the job. Its torquey 2.5 litre common-rail turbo-diesel four cylinder engine and effective four wheel drive system pulled us strongly and safely through and over mud, sand, broken surfaces and heavily-ridged roads. From our point of view its main drawback was that it didn’t have a boot, so all our luggage had to be strapped to the pick-up bed, where it was easily-accessible and vulnerable (although we were lucky; none of it disappeared), and within the first 24 hours, all our spare clothes etc. became waterlogged during the incessant deluge from the heavens. At the first opportunity, our first purchases were tarpaulins plus lengths of rope, with which to protect our luggage. We live and learn! Rachel and I shared the driving during our tour. She was already adept at piloting the Hilux in conditions of torrentially heavy rain and, for example, along unmade tracks that snaked through undergrowth comprising huge and strange but beautiful looking plants I had never seen before, and I too enjoyed the challenges provided by motoring in conditions so different from those encountered at home. 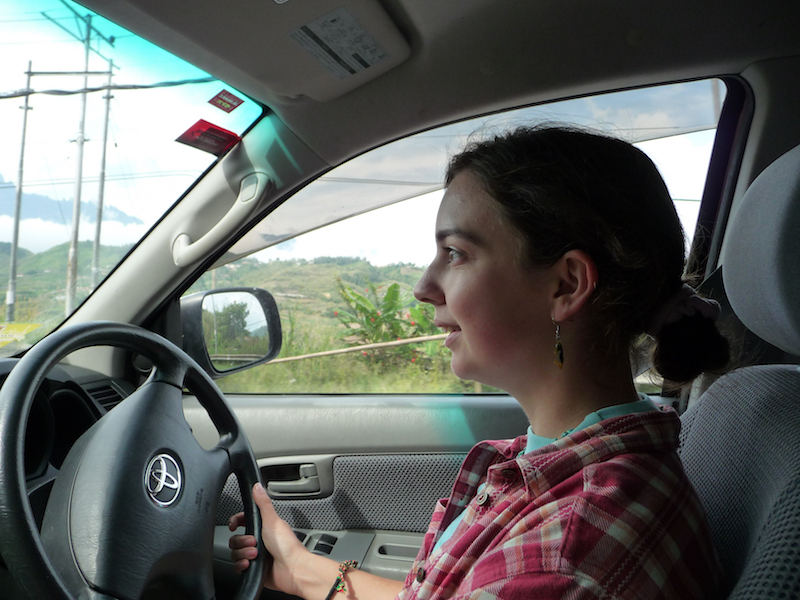 Rachel enjoyed taking the wheel of the Toyota for long stints during our tour. While touring in Sabah we were fortunate to meet so many local people, who, in their various different circumstances, were helpful, friendly and welcoming. An abiding memory for me was when I was refuelling the Toyota on the outskirts of a town, when a local gentleman made a point of walking over from the pay kiosk towards our truck. “Are you British?” he asked. No doubt our ‘European’ appearance highlighted the fact that we were not from Sabah. Of course I wasn’t sure what the ‘correct’ reply was, but anyway answered “Yes, I am”. He smiled broadly, extended his hand in a friendly manner and said, “I just want to welcome you to Sabah, shake you by the hand and hope that you have a lovely stay here”. 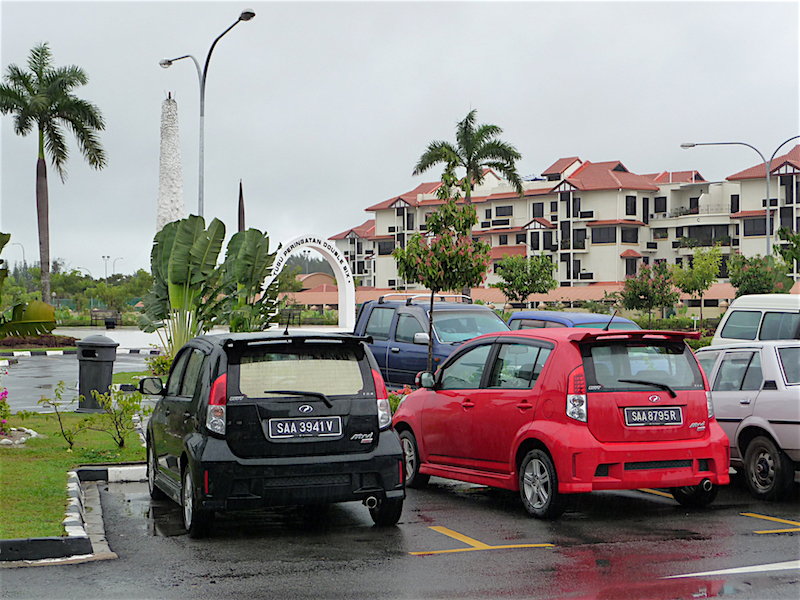 These two Proton Myvis were parked together in Kota Kinabalu, at the Double Six Memorial which marks the site of an aeroplane crash on 6th June 1976, in which the first Chief Minister of Sabah, Tun Fuad Stephens, plus six other state ministers, were killed. I tried ‘classic-spotting’ and saw a venerable VW Beetle, plus two long-disused Morris Minor 1000s as well as some more modern classics that were in daily use. 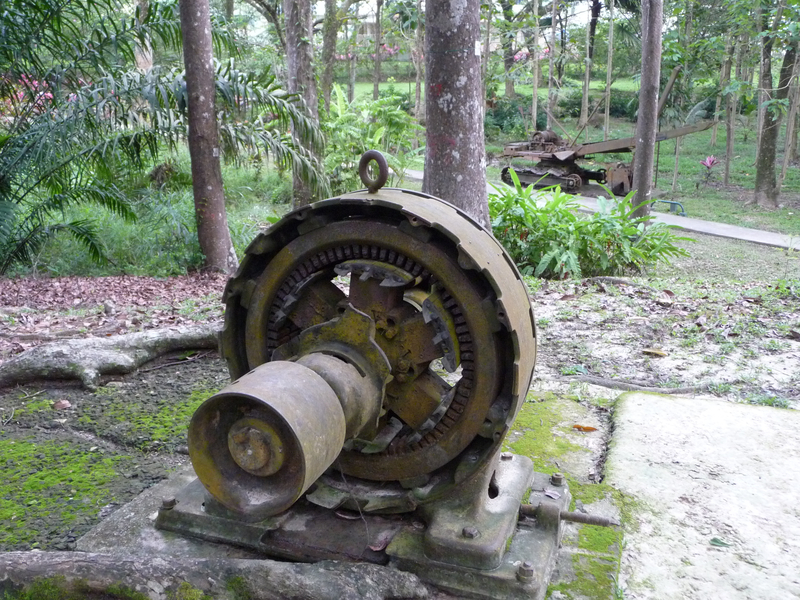 Shortly after our return home, Rachel spied a 1920s Austin Seven in Kota Kinabalu. 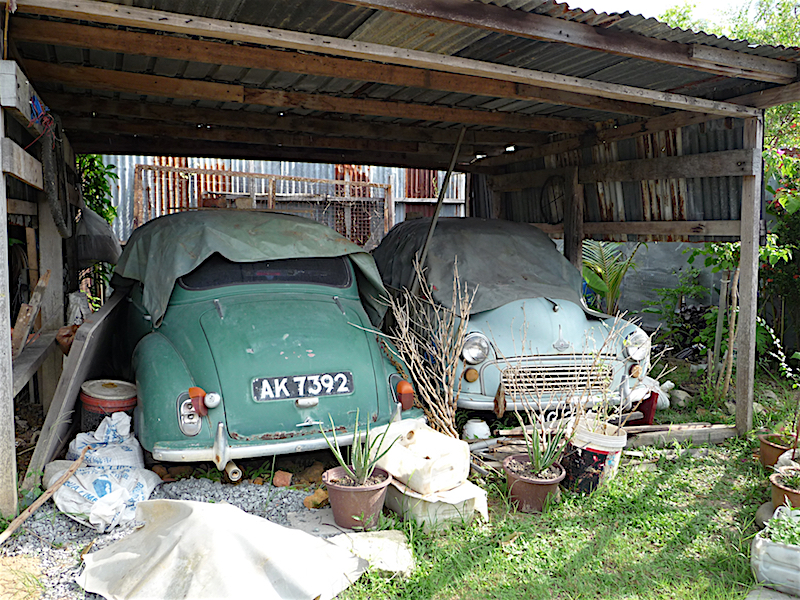 I couldn’t repatriate these two Morris Minor 1000s but hope that someone in Sabah will return them to the road! 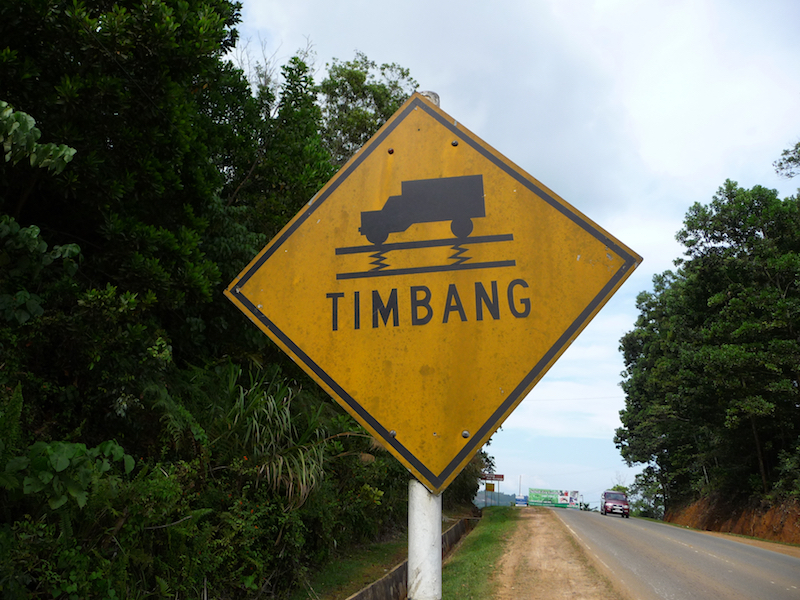 When driving in Sabah, you have to be prepared for ‘anything’. Overall, local vehicle safety, emissions and driving seem more worrying than in the UK. 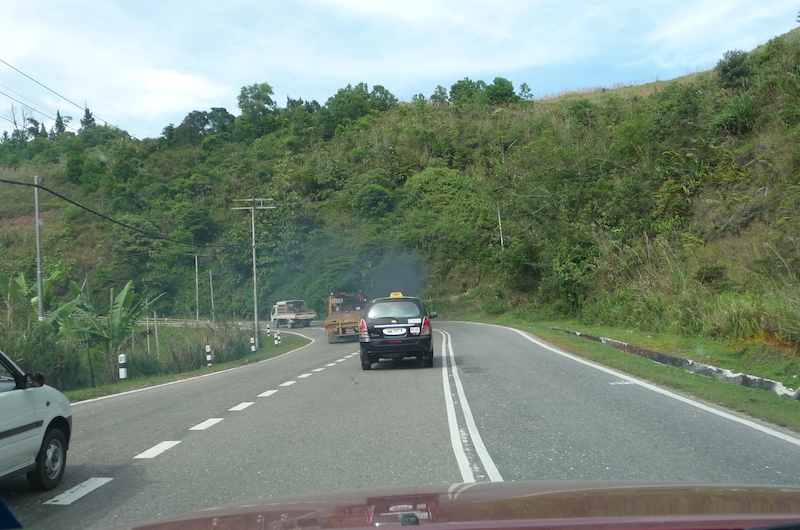 However, initially it was still surprising to me to round bends and encounter palm oil lorries and coaches overtaking when coming towards us uphill, pulling out suddenly and, with little acceleration available, blocking our path. Evasive action/taking to the verges was often the only way to avoid a collision. Fortunately Rachel was already used to this and drove impeccably in frequently difficult/dangerous situations. This coach had come off the road just before we arrived but luckily in this case nobody was hurt. Often too the use of indicators by local drivers was ‘occasional’ or ‘not at all’, so we found that the best policy was simply to try to keep out of everyone’s way… Thankfully that worked for us. Another aspect of driving that took some getting used to for me was negotiating roads so badly affected by flooding that the tarmac often disappeared for long stretches. In these situations the Toyota had to be carefully guided through meandering mud and sand until solid ground was reached again. Where has all the tarmac gone? 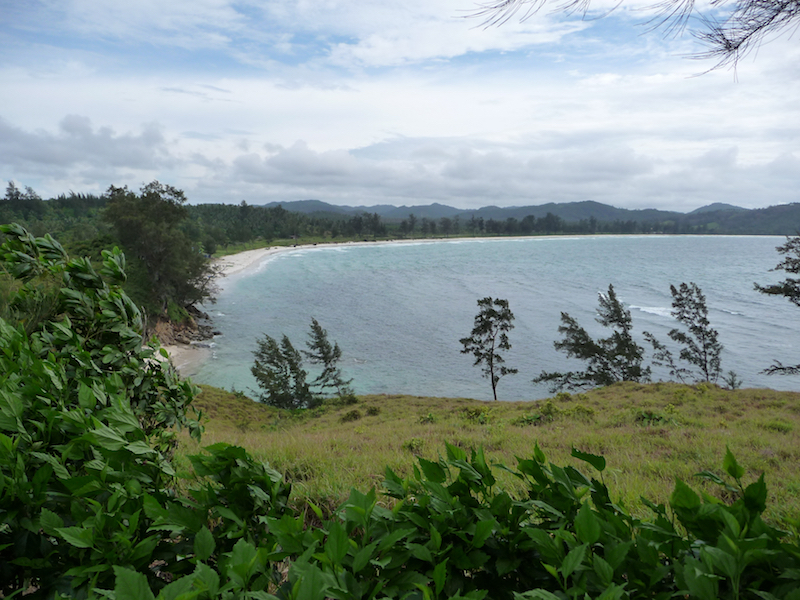 On an unmade stretch near the Tip of Borneo. In other sections the tarmac road surface had sunk in spectacular fashion (as its underpinnings had been washed away), and very often the sudden change in surface height was not evident until we were almost upon the hazard, whereupon the vehicle would suddenly ‘drop’ off the steeply sloping step into the depression, then we had to drive slowly up the equally steep slope/step at the far end of the lowered section. Great care was needed to stay on the road and avoid damaging the vehicle, and we were thankful that we had not attempted our long-distance motoring in a normal saloon or hatchback. Paddling in the South China Sea near the spectacularly beautiful Tip of Borneo. 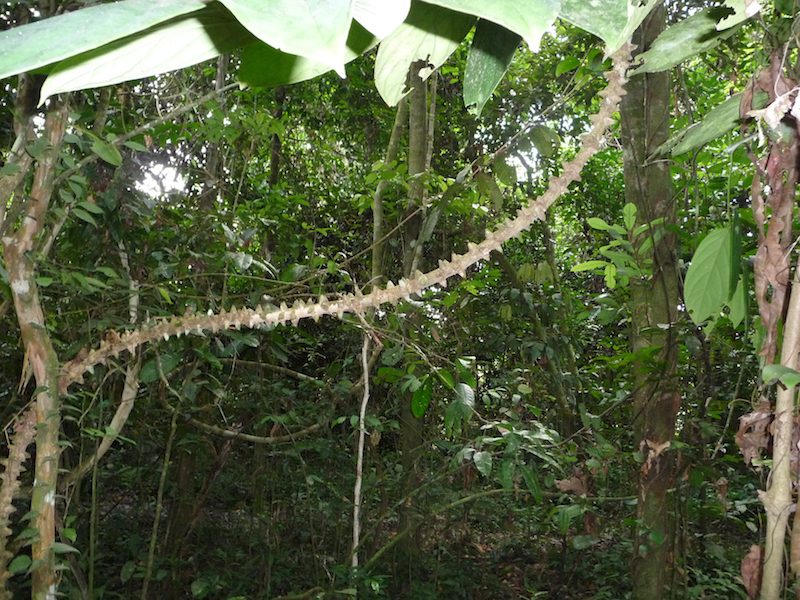 Walking to the edge of the rainforest at night, for the very first time, and listening in awe to the ‘sounds of the jungle’. 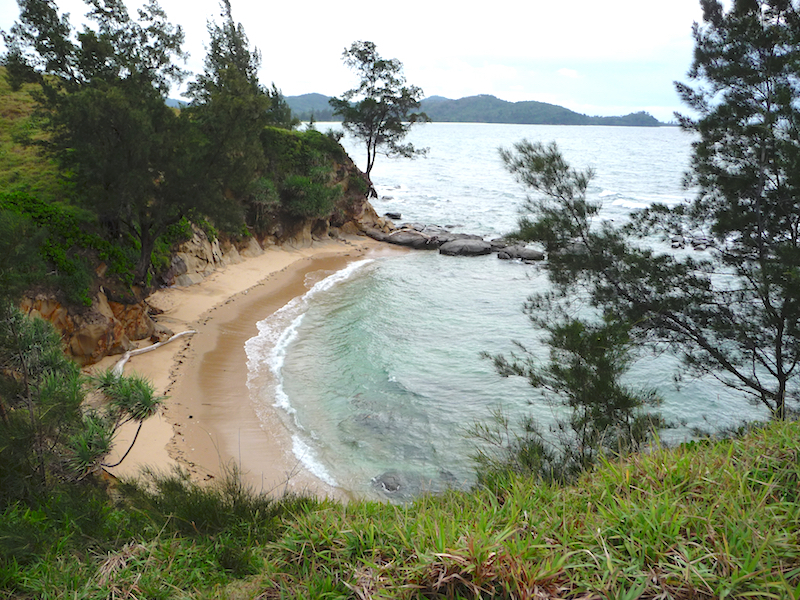 A beautiful and deserted bay adjacent to the Tip of Borneo. 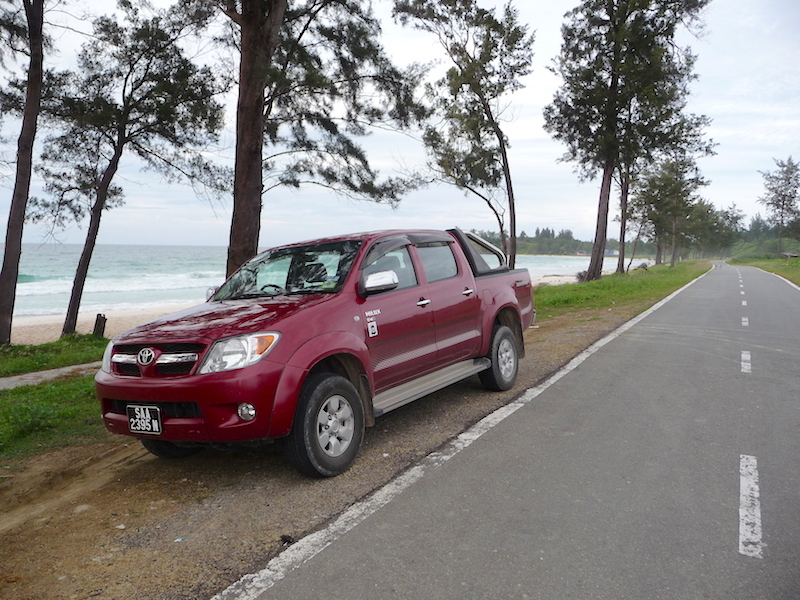 ‘Our’ Toyota, pictured when pausing at the edge of the South China Sea near the Tip of Borneo (we paddled here). 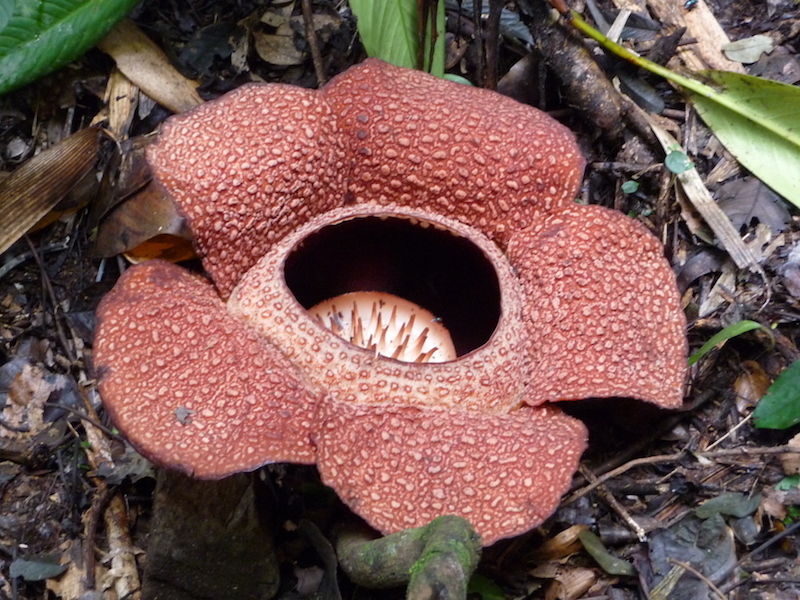 Being taken through the rain-soaked forest to see the biggest flower in the world, the ‘Rafflesia’ (about six feet across; it blooms for just a few days – local people earn cash by taking visitors to see examples while they are in flower; like the superb example below…). 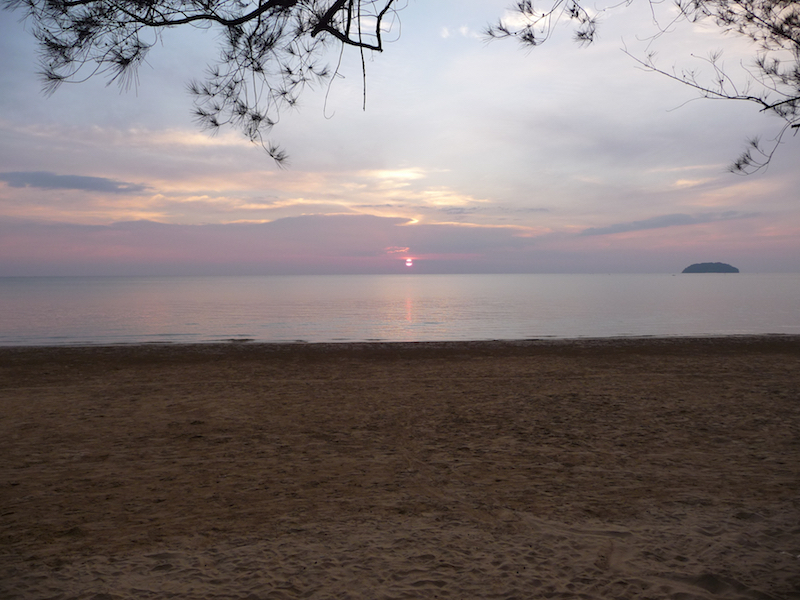 Watching the sun set on over a perfect calm sea and beach near Kota Kinabalu (shown below…). We also viewed the rainforest canopy from precarious walkways high in the trees at Poring Hot Springs, crossed fast-flowing rivers on rope bridges and visited the famous ‘bat caves’ at Gomantong, where in equal measure the piles of bat droppings and the resulting billions of cockroaches balanced the brilliant bats (but this really was not a place in which to slip up…). Towards the end of our stay the floodwaters of the Kinabatangan River subsided, and we were able to travel to the Field Centre as originally planned. 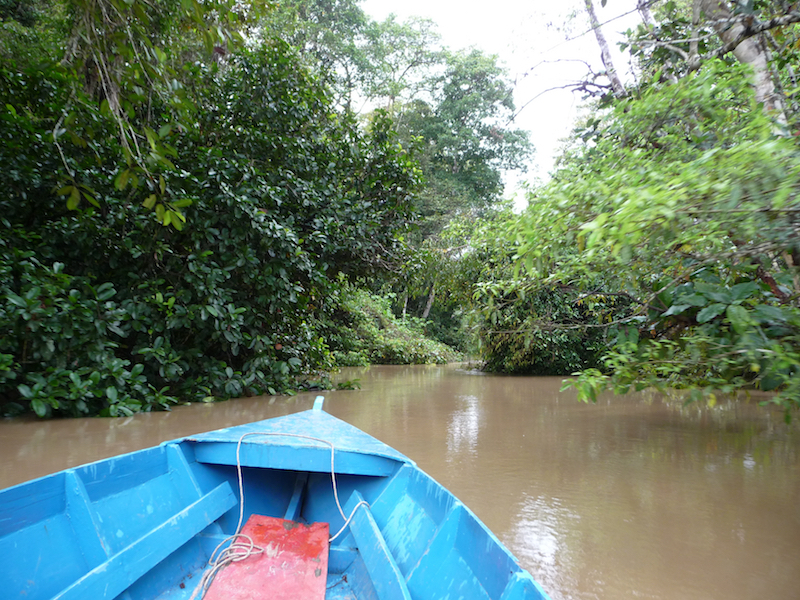 This entailed several hours by road, then a two hour trip along the river in an open motor boat. The river waters were still above normal levels, so when walking between our wooden bungalow and the Field Centre’s main building at night we were advised to stamp our feet to discourage crocodiles and snakes (and they can be VERY large!!!) from taking a close interest. 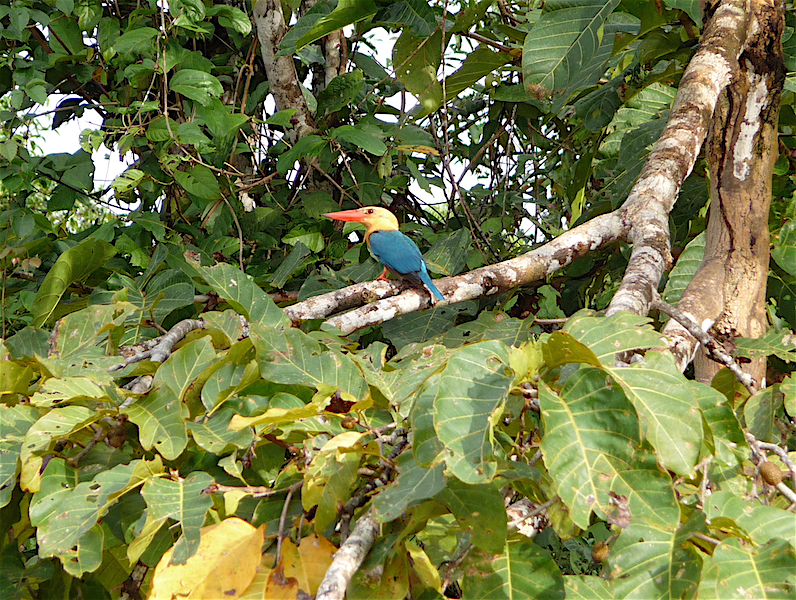 The Field Centre (established to aid learning about this amazing rainforest) was excellent, and enabled us to experience a little of the adjacent jungle. The constant extreme heat and ultra-high humidity took a little getting used to, but after a few days we began to take the effects for granted. Another highlight of our visit to the east of the island was visiting a local village and taking part in a ‘homestay’ programme, under which we stayed, at an affordable rate, with a local boatman and his family. He earns a living by taking in tourists and guiding them along the river in an open boat. So we enjoyed a traditional evening meal with this friendly man and his family, and were taken across the swollen river at night in his boat, to witness (by searchlamp that didn’t disturb the animals) Borneo pygmy elephants feeding on the far bank of the river. At 5am the next morning, we were off again in the same boat, this time diverting from the river’s main course to pass through narrow, vine-laden tributaries and backwaters, where we heard birds singing in the bankside trees and witnessed proboscis monkeys (with prominent noses), also seeing birds possessing plumage in the most vibrant colours imaginable, as well as strange plants that were beautiful to behold. Eventually, after nearly three weeks in Sabah, we had to return to Kota Kinabalu to start our journey home, delighted that we had visited such beautiful places, met such fascinating people and witnessed such amazing wildlife, yet sad that we had to leave all this behind. We travelled back to London via Singapore, where, together with Rachel and her fellow student friend Chloe (also studying at Cardiff University), we spent a few days taking in the diverse culture of the place. We travelled extensively on the impeccably clean and efficient ‘Mass Rapid Transit’ or ‘MRT’ underground train system, and enjoyed visiting Raffles Hotel, the huge Singapore Zoo, the harbourside and the Hard Rock Café – but all these are ‘other stories’! As we took a long flight heading towards London, the girls flew back to KK and returned to the Field Centre in Sabah to complete their year of studying there, before completing their degree courses at Cardiff. 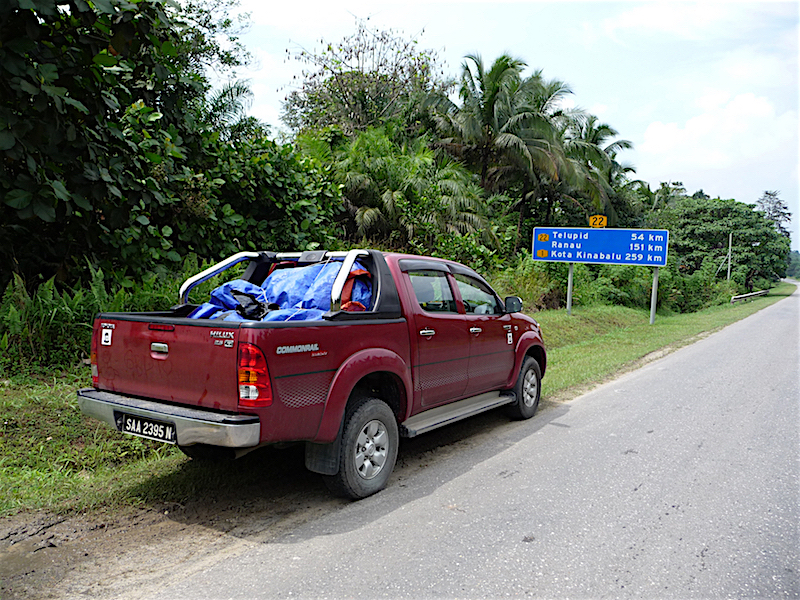 I shall never, ever forget the wonderful road trip we undertook in Sabah (North Borneo), and the helpful friendliness of the people we encountered. Indeed I would love to revisit this beautiful place, and count myself very lucky to have had the opportunity to experience it. If ever you get the chance to go there, I recommend that you take it.